Dr. Tavari was born and raised in Los Angeles. She received her Bachelor’s degree in Neuroscience with a minor in Craniofacial and Dental Technology from the University of Southern California. She then went on to attend the University of Southern California’s Ostrow School of Dentistry for her Doctor of Dental Surgery Degree (D. D. S.), graduating with honors. 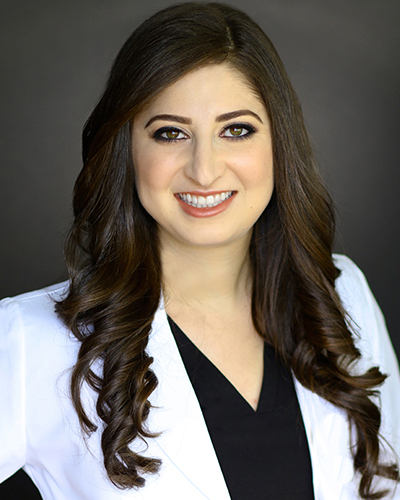 Dr. Tavari then further pursued her passion for dentistry and continued at USC to complete a specialty residency program in Advanced Periodontology, gaining expertise in implant surgery and IV sedation. She also earned a Masters in Craniofacial Biology (M.S.) during her residency career. While pursuing her dental education, Dr. Tavari also actively conducted and published research in collaboration with Dr. Homa Zadeh, in the fields bone regeneration and implant dentistry. She received the 2017 Robert Merlin Student Leadership Award from the California Society of Periodontists. Dr. Tavari focuses on patient-centered care, customizing treatment to each patient to provide the most comfortable, esthetic and minimally invasive techniques to achieve each patient’s dental health goals. She is also an active member of a number of professional societies including the American Academy of Periodontology, Academy of Osseointegration, California Society of Periodontists, and the California Dental Association.